Be greeted by our English-speaking guide and driver at the airport exit; tranfer to hotel. The guide will hold your name sign for you to recognize. Get ready and start our sightseeing. Visit the Chen Clan Academy. 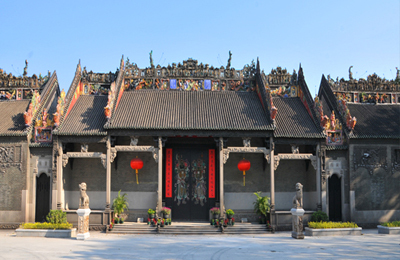 It was built by 72 Chen clans for their juniors’ accommodation and preparation for the imperial examinations in 1894 in Qing Dynasty. Now it has been changed into Guangdong Folk Art Museum. Move on to the Lizhiwan Creek, a important historical area located in the heart of Xiguan and adjacent to the Pearl River. It is home to the former sites of many famous people and gardens. Back to hotel after the tour. A full day sightseeing today. Let’s first come to the Nanye King’s Tomb Museum, the oldest and largest Han Dynasty tomb, and also one of the 80 globally renowned tombs. It is highlighted by the jade-silk made garment. Head to the Six Banyan Tree Temple, an ancient Buddhist temple famous for the beautiful Flowery Pagoda inside. Transfe to Zhujiang New Town, Guangzhou’s new CBD with business landmark buildings. Finally, visit the shopers’ paradise, the Shangxiajiu Pedestrian Street in adittion to the traditional local buildings there. Two main Guangzhou sights before your departure. The Yue Xiu Park is the largest park in downtown Guangzhou with beautiful surroundings. The Huacheng Square is now a renowned sightseeing and shopping destination. Be transferred to Guangzhou airport for departure. Thanks for using our service.